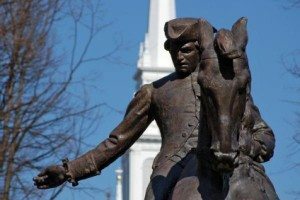 If you live near Lexington and Concord, Massachusetts, you’re probably well aware that these town pull out all the stops to celebrate Patriot’s Day. This year the historic festivities take place this weekend (April 13, 14, 15) as Lexington celebrates its 300th birthday. Good news for family caregivers; this is an opportunity for you to bond with the person in your charge and feel connected with the local community. With a little forethought, seniors in care can enjoy the revelry of Patriot’s Day weekend. The annual parade has been shifted to Monday, starting at 2:00PM. If you decide to bring your elderly parent or grandparent to the parade, there can be a long walk from where you park, it’s best to have a friend drop both of you off close to where you’ll sit, and pick you up there when the parade has cleared out. Pack a water bottle, tissues, a portable lawn chair, a small snack like crackers, and a sun hat for a seamless good time. Remember that reenactments involve rifle shooting and can be very loud. Hearing aids and eardrum damage in the elderly can make sudden loud noises seem louder, painful, or distorted. Bring earplugs or attend an alternative activity. The St. Brigid Parish Church will hold their annual pancake breakfast all morning on Monday, April 15th. For a calendar of Lexington Patriot’s Day activities, go to to the city of Lexington website. For information on Minute Women Home Health Care, visit our website.